Most of the people around Prey Preah Rokar Forest support their livelihood by getting the beneficiary from this forest. The Forest has tons of biodiversity including traditional herb, wild animal, natural streams, ponds, Lake and so on. Today, Ponlok Khmer took a special chance to open up a forum with members of Prey Preahrokar Forest Community Network (PFCN) to discuss and find solutions on what the illegal activities being committed and bringing destruction to this forest. 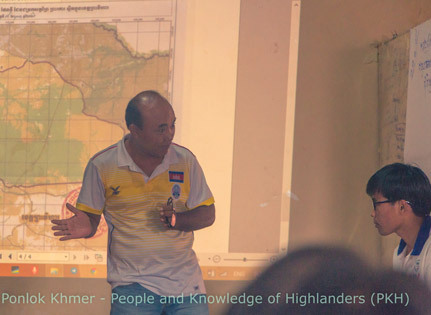 Mr. Ek Yothin is describing Prey Preahrokar Forest to the Prey Preahrokar Forest Community Network (PFCN).